Get some exercise – Moving your body releases endorphins, your body’s natural pain killer. Get adequate sleep – Pain levels can increase when you don’t get enough restorative sleep. Try ice or heat – Ice can reduce inflammation in acute issues, while heat can stimulate blood flow to encourage healing. Strengthen your core – Developing core strength will lend support to the spine, especially the lower back. Stretch your hamstrings – Tight hamstrings can be contributors to chronic back pain. Stretching them once or twice a day can reduce strain on the low back and SI joints. 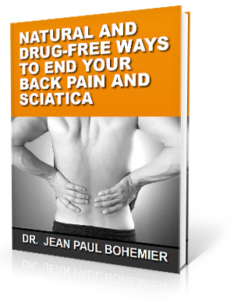 To learn more about the connection between head and neck injuries and lower back pain and sciatica download our complimentary e-book. by clicking the image below. If you’ve been incorporating these recommendations into your day to day routine, but you still have nagging back pain, it can be due to spinal alignment. The spine works together like links in a chain to provide the framework for the body to maintain an upright posture as we go about our day. Regardless of where the back pain is located, there is one link in the chain that is critical to check. The atlas vertebra, which sits at the very top of the neck, can be the culprit in a lot of nagging back pain cases. Even though that may not be where the pain is located, it can be the source of many issues. Since the atlas carries the weight of the head, about 10-12 pounds in the average adult, when it misaligns it will set in motion a series of compensations. In order to carry the weight of the head and keep the eyes level, the body will adapt by dropping a shoulder or hiking one hip up higher than the other. This causes unequal muscle tension from side to side, which over time can lead to back pain just about anywhere along the spine. We can chase around symptoms all day, or we can address the root cause by adjusting the atlas and allowing those compensations to clear up. At Solara Health, our upper cervical approach to care does exactly that – we address the back pain at its cause to allow the body to heal from stubborn back pain naturally.